Lead Lined Steel Doors & Lead Lined Frames Provide Unsurpassed Protection Against Radiation, While Still Maintaining The Appearance Of A Traditional Steel Commercial Door. Our Inventory Of Anti-Radiation Doors Comes In Both Mild Steel And Stainless Steel. So, What Exactly Is A Lead Lined Door? It Is A Door With Lead Sheets Lining Its Internal Core, So That Radiation Cannot Penetrate It. 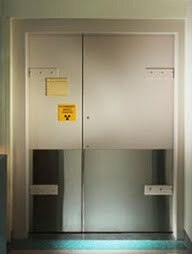 These Types Of Doors Are Ideal (And Often Necessary) For Facilities In The Scientific, Nuclear, Medical, And Industrial Industries, Or Wherever Radiation Is Or Will Be Present. All Of Our Door And Frame Products Can Be Supplied With Lead Varying In Thickness From 1/63″ To 1″. Some Facilities, Such As Facilities In The Aeronautics Industry, Can Install Swinging Or Sliding Lead Lined Doors. Fire Labeled Products May Be Supplied In Singles Or In Pairs, And Have Been Tested In Accordance With NFPA-80. All Fire Labeled Lead Lined Doors And Lead Lined Frames Are Certified By Underwriters Laboratories And Warnock Hersey International. The Ambico Anti-Radiation Doors Are Equipped With Only The Purest Lead Available, Making This Product One Of The Cleanest And Most Environmentally Friendly Radiation Shielding Providers On The Market. Our Variety Of Lead Thickness Allows Us To Fit The Needs Of All Types Of Facilities, From Hospitals To Health Clinics And Everything In Between. Allow Us To Help You Find The Ideal Lead Lined Steel Doors And Frames For Your Facility Or Next Project. Our Skilled Customer Service Representatives Can Help You Come To A Quick And Logical Decision On What Door Best Meets Your Needs And Budget. Aside From Doors, We Also Offer One Of The Most Extensive Hardware And Accessory Inventories On The Market, Making Us The Premiere Steel Commercial Door And Hardware Provider In South Florida.